Tried to take advantage of the break in the weather yesterday. But those Northerlies just won't back off. Friday was apparently the pick of the days, but a sick child prevented us from getting on the water. He still wan't 100% on Saturday, so a short trip was planned to fish some spots in the bay with plastics. No real target species, just anything that wanted to play the game! We left from the new Ross River boat ramp an day-break and headed to our first spot. On arrival the Side Image of the Humminbird was showing schools of fish tightly working around the area. The Minn Kota was deployed and we 'spotlocked' into position. 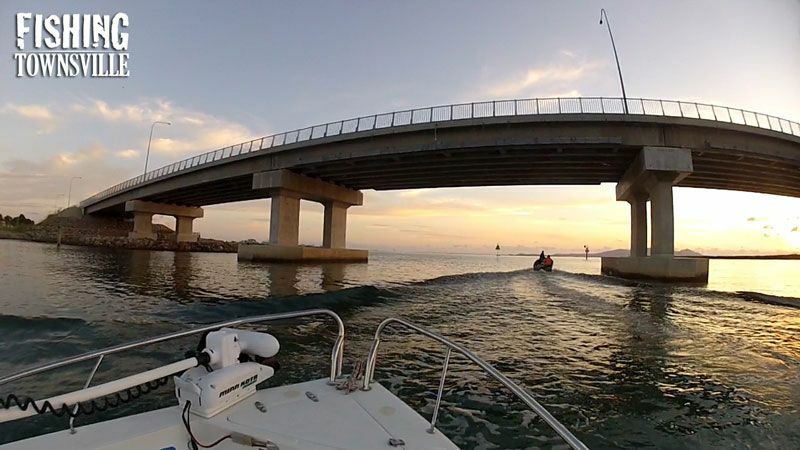 The fishing was slow, but the occasional hit and small fish kept us going. The first decent fish to be landed was a nice GT that took my Threadybuster on the drop. 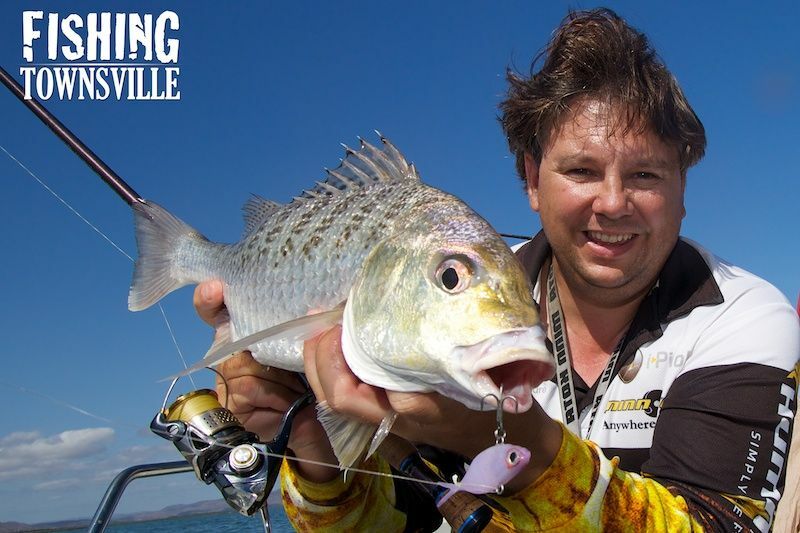 A great fight in relatively shallow water and on light gear. This was a good sized fish for this area. 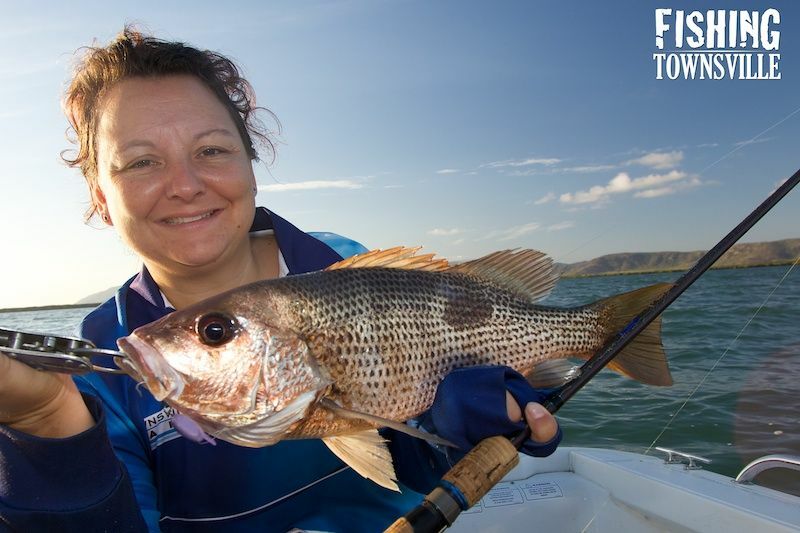 The next decent fish hit Tania on the new 60mm mini Threadybuster. She was using the little Stella 1000 and really enjoyed the fight. But it didn't take long and a nice little 40cm Fingermark was led to the net. 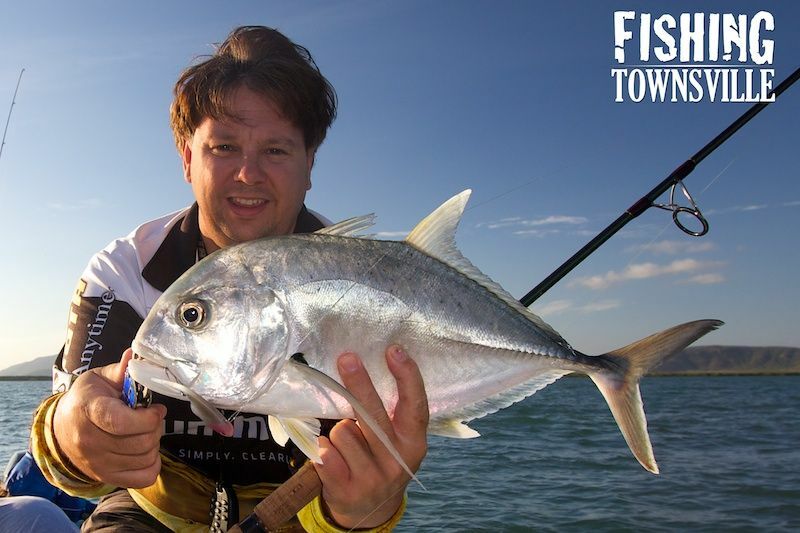 We had landed a few small Grunter for the morning, and missed hooking up heaps of bites from what I assume were Grunter, but finally a decent fish smashed my Threadybuster. Looking like a solid 50cm fish, it spat the hooks just out of netting range. Not to worry, a few casts later and this fella was successfully landed. These new 60mm mini Threadybusters really suite the smaller mouth of the Grunter. The snack sized plastic has an excellent vibration and is fished the same way as its bigger brother. Its well worth grabbing a few and having them in your tackle box. Sebastian fished hard all morning. He really likes his lure casting. 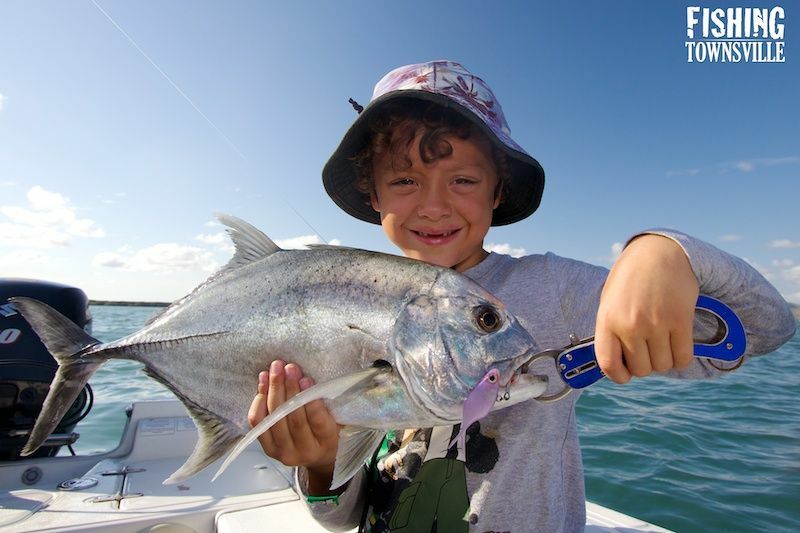 And throwing soft plastics like Threadybusters in relatively open waters is much easier for a young kid than putting lures among snags. He managed to land an assortment of smaller Trevalley and Queenfish. But it was this nice GT that really made his day. Fishing with a small Sustain 1000 it had him doing circles of the boat. But with a little help from Mum and Lachlan the net boy, he was able to lead it in for a quick photo. I would have really loved to run offshore, but the Northerly was lightly white capping in the bay and Lachlan wasn't feeling well in the heat. So by about 10am we called it quits and ran home. Give a kid a break!